I love spring and the first few cards of the season are so refreshing and light! It's good to break out the pastel colors again! 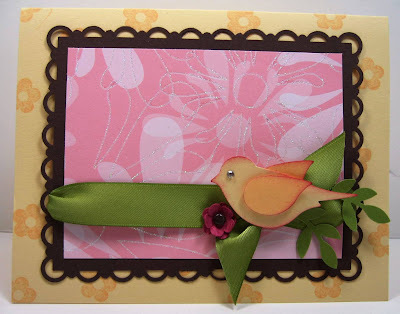 This one is based on a card I liked on Stampin' Connections made by Michelle VanWiggeren. This is such a soft feeling card. The Chocolate Chip cardstock started out at 3-13/16" x 4-3/4". DSP is 3" x 4". I love this card.... I've been trying to become creative (unsuccessfully) with the bird punch and I love how you've inked the bird's edges.... Just fantabulous!!!!! Becky love the card but I have to ask.....can/are you going to do a tutorial on how to do the border and corner punches....I was trying to do it yesterday and just gave up! This is such a pretty card. I just love everything about it.Mind you everything you make a beautiful. Thanks for the inspiration. Love what you did with the bird. What a great idea to put a wing behind to make him more 3-D. The sponging really adds to the look. I'll definitely be using this idea. Thanks.